This afternoon I got a postcard … from myself. About seven weeks ago, I was embarking on the four days of heady alternative reality that was Greenbelt 2011. The good folk of the Feig community based at Gloucester Cathedral held a Communion service in the midst of a lavish feast for what looked like about 200 of the contributors on the Thursday night prior to the start of the festival. It was special… for me, there was a strange circularity about being in Gloucester Cathedral for the second time in my life. The first time I was there was nearly 20 years ago as part of a primary school residential trip, many miles away from my home in the Thames Valley – probably the first time I had been away from my parentals for more than a couple of nights. I saw the shadow of my thirteen year-old self admiring the cloisters, innocently unaware that life would bring me back there two decades later as a very much more grown person who was wondering (as I often do) what happened to the little boy in me. These were the things turning over in my mind as I broke bread with many others I had never met before, that night. As part of the service, we were encouraged to choose one from the hundreds of postcards scattered about the interior of the Cathedral where the hard pews had been stripped away to restore it to its original medieval awe-spaciousness. We then wrote on the cards and addressed them to ourselves and “posted” them. 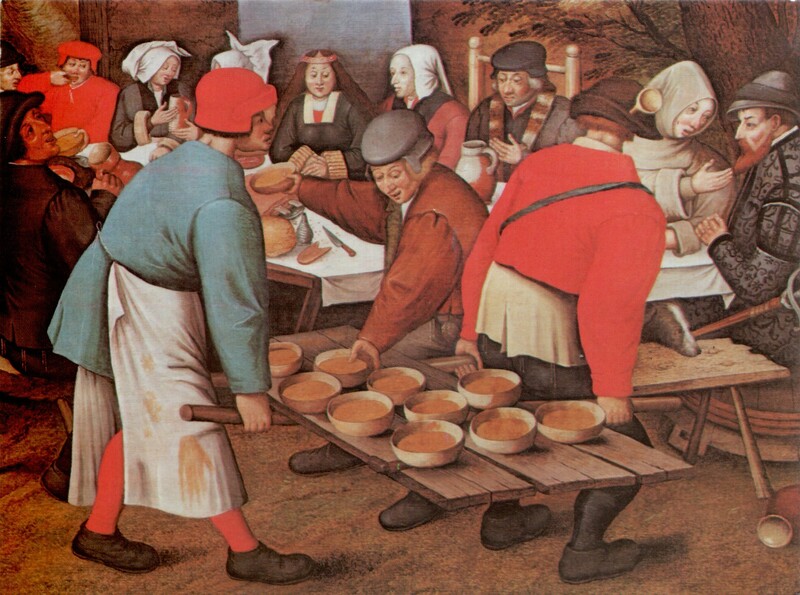 I was delighted to come across a fragment of a favourite artist: Breughel. Scientists demonstrate that when a string of certain length is sounded in the vicinity of other strings of differing lengths, all those strings that are the same length or other specific mathematical variations in length will begin to vibrate in harmony. This is a picture that plays a very full chord for me as I look at it afresh today. The people who, in my experience, give the most life to others are those who really know how to enjoy its sweetness themselves. From the nobleman on the right to the cardinal on the left, the dog under the table, the cook, the bride, everyone is welcome. Let’s tear the doors off, bake bread and stir lentils until we are truly home! To anyone at Feig who reads this: “thank you”, from the bottom of my heart. To everyone else: Which of these revellers are you? She seems to present some sense of serenity in the midst of everything. I think she might, in fact, be the bride. The other fellow you notice is thought by some to be the groom – two sides of the same person, indeed … perhaps. 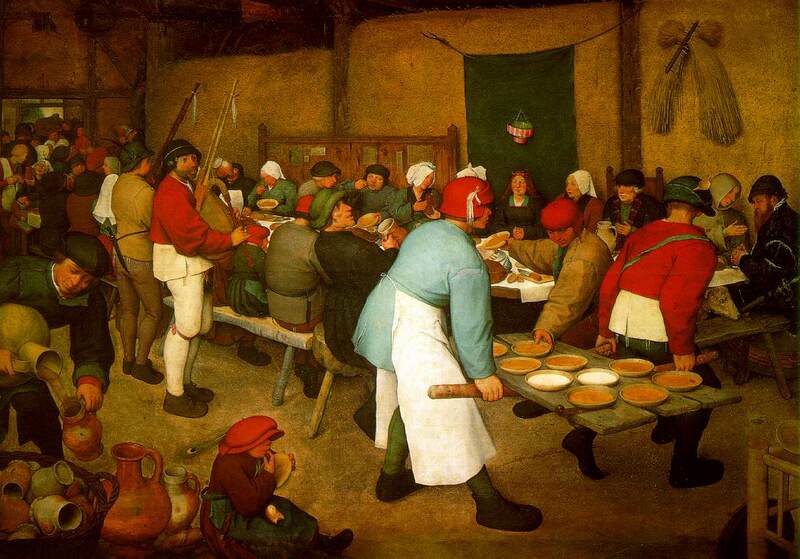 This picture must be a copy done by the younger Breughel of one of his father’s most famous paintings and there are some subtle yet quite significant differences in his version. The more I look into the symbolism here the more it fascinates me.